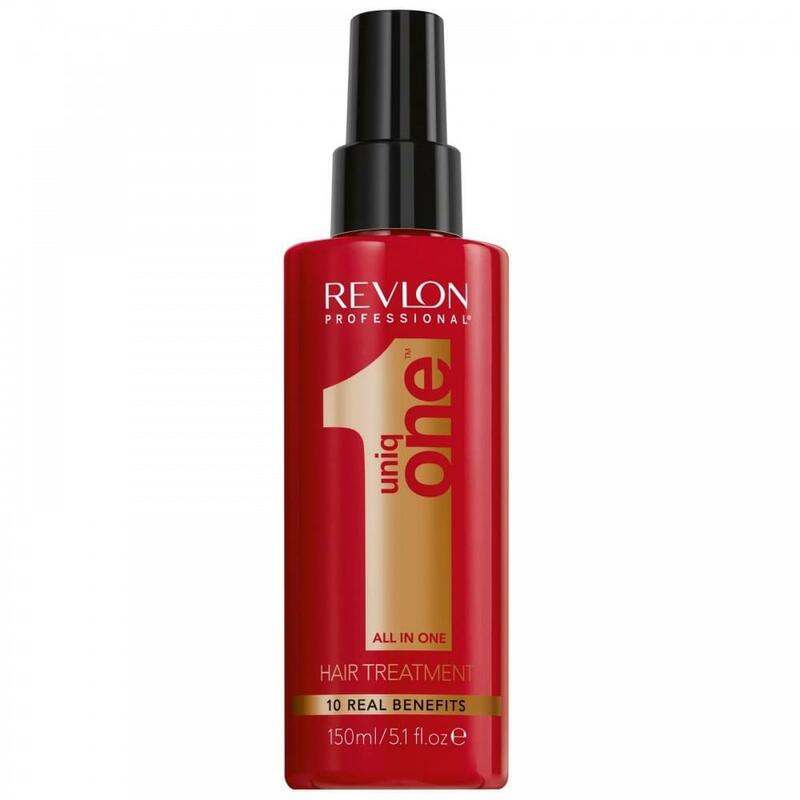 Revlon Professional Uniq One Original All In One Hair Treatment Original (150ml) is a leave-in hair treatment spray that offers a host of benefits to all hair types.A unique concept in hair care, this leave-in treatment provides 10 benefits to all hair types, from shine and frizz control to colour fade protection and UVA/UVB protection. Dry in the usual way, with dryer/irons etc. Finish with your usual products. Spray Uniq One onto the palm of your hands. Apply to the hair from mid-lengths to ends. Review Summary - 4.9 out of 5 based on 426 ratings. Love this product!! Highly recommend it and I had it within two days from order in my hand through Justmylook! Very impressed so thank you! Product is really good, makes your hair so soft !! Would recommend. Delivery was as stated 2-3 day received the product on the 3rd day. I will be using this site again. Great product, does wonders with my hair! Love this 10 in one spray. Protects your hair at the same time as keeping it soft and manageable. Would definitely recommend!! Excellent Product. Leaves hair soft with no frizz. Genuine product.... only issue was its not sealed. Great price compared to salon prices will defdo buy again. Love it! Keeps my hair in control and frizz free. Thank you. I swear by this product! My hair can get really knotty after washing and this is the best detangler! Also stops my hair being static and keeps it volumised. Love it! I have used this product for a very long time. It smells amazing, is lightweight, so doesn't leave your hair greasy. It does exactly as it states. My friend introduced me to this product and I love it. It smells nice and leaves my hair frizz free. Have also noticed that it volumizes my already big hair and my natural curls are bouncy and not dry and frizzy. Perfect all round hair treatment spray. Does what it says in the bottle. lovely product. smells amazing. best price found through Just My Look and excellent speedy service. Love this hair product it makes your hair super soft. This was recommended by a colleague and I am so pleased I bought it. My frizz is banished and my hair feels really silky. It looks shinier too. Excellent product..... does just what it says on the bottle!! I’m always looking for new products that will actually do something with my coloured hair, plenty of bleach in my hair so need something good. This spray is perfect, super soft hair. Just sprayed some on dry hair before using straighteners for curls and it’s done a fab job! Nice smell, keep my hair soft. Can’t see any improvement in my hear condition , just soften it . I have long straight hair and bought this as my hair is always knotty after I wash it and I am so glad I did. It is brilliant!! It took a third of the time to comb it through after washing, I will definitely be buying this again! Highly recommend it. I would say it's absolutely one of the best hair products I have used in a long time . It definetley dose exactly what it says on the box. Which is very Rare . Really good I found it to be a really good detangler for my fine hair. Love this product, buy it over and over again! This product was recommended to me by my hairdresser as it does lots of different jobs all in one. I use it for heat protection and also as a finishing product. It smells divine. Have used this product for years, smells lovely and just a light spray on towel dried hair gets all the knots out. This is great for school morning hair that is difficult to brush! Great product. Leaves your hair soft and shiny even after styling. Great item at a discount price. Received really quickly. Will definitely use again! This product has been the best thing ever for my hair. This is a fantastic treatment. A hairdresser used on me a few weeks ago . Even just to brush my hair with this on is much better. I just love this product. It’s so light. Easy to use. I notice the difference when I haven’t put this product on my hair. Great smell too. I have only used this once so far but my hair felt quite soft after and not as frizzy. Have been using this product for over a year- and love it! Product arrived promptly and was very well packed. Been using this product for a few years now it's excellent. Love this product, i use it dor years. This product (Uniq) has made my hair very soft. Can't wait to use it again. Amazing. Hair was breaking. In so much better condition after using this product. Excellent for controlling frizzy prone hair. The shine on your hair after use is quite unbelievable - is Winkleman's secret hair shine product now known? Used a few times now & I can feel & see the difference in my hair, would certainly recommend. Love this product and always buy it wouldn't want to be without it. I bought this as my hairdresser uses it in the salon. My hair feels very silky and shiny and smells great. I would definitely recommend. Excellent product. I notice the difference in hair when I run out! I'm a hairdresser, so I go through alot of this! It does last a while though. Fantastic smells gorgeous .and makes your hair feel.wonderful. Excellent product, makes my newly washed, knotty hair, sleek and manageable - lovely scent too! Excellent service , extremely pleased. Brilliant product, smells good too. Great product.Does what it says. Does exactly what it says - my hair feels really good after using, and the product has a gorgeous smell that stays on my hair until the next wash. Would definitely recommend. I have been using this for a while now, my hairdresser uses it. It does exactly what it says and doesn't weigh hair down or make it greasy. My all time favourite product! I love this and would recommend it to anyone. Makes your hair feel like still without making it greasy like many other products I've tried. I use this all the time and love it . I chose from you as postage was free plus competitive price and good, fast delivery. Wouldn’t be without this! It’s great for keeping my grey hair from yellowing with my straighteners and the sun. A terrific product. Started using this when my hair after washing my hair when it felt dry. Wouldn't be without it now. Very good, gave my hair added volume too... like the smell and a good price too. This is amazing. Smells so nice and it doesn’t leave your hair greasy, even if you don’t dry your hair. Great all round product. Wouldn’t be without it. Excellent product for my dyed short hair. A sweep through of product on my comb on wet hair keeps it looking shiny and healthy all day. I have been using this product for several years now and swear by it. When I get out of the shower my hair is like matted candy floss and impossible to get a brush through! A few sprays of Uniq One and the brush glides through. Also, despite having long hair, i don't suffer with split ends. Would highly recommend it! A great product, styles well and leaves your hair feeling soft and shiny. An excellent leave-in product, gorgeous smell & brilliant results. Great product - good at helping preventing my hair from tangling. Ion less than a week I ordered twice 2x Uniq 1 bottles each time. First order they did not send the travel size one as they advertised. Second order I put bought before the time they guaranteed it would be delivered next day and it came 4 days later. I love this product. I use after shampooing, and before blow drying. Conditions and keeps my hair shiny! Since moving house I've had to source my own Uniq 1 and yours is the best ever price.It's a great product and my hair feels so nice when I use it. Excellent product, really helps with to tame my mane and leaves it feeling soft. Smells amazing, easy 10 in one product for people who jus want the job done. Delivered to me very fast, wrapped secure and even came with a free conditioner! Oh and free delivery. Very happy with my service from just my look.? I love this product, just a small amount needed before blow drying my hair. Leaves wet hair tangle free & manageable. It does exactly what it says on the bottle and smells great too. Best treatment out there for damage hair and a bargain too! Hair is now in great condition since using this. Used loads of mouses and treatments but this is the best and keeps my hair soft and conditioned not sticky, smells great too. First received this product as a sample and I really liked it because it makes my hair feel lovely and soft and protects it from heat, unlike other heat and hair treatments which have made my hair feel sticky and appear dry it is all so very good value compared to other products on he market. Have since ordered the full size. Very pleased with product and service. I recieved a small sample of this product and it was so good I purchased the full sized one,it helps to calm frizz and makes styling very easy also helps style to stay in place,highly recommend. Leaves hair feeling amazing ! Good on coloured and permed hair. LOVE LOVE LOVE this product! I've tried all 3 & been using for years. I cannot comb out my long hair without this. I highly recommend this product. Both boxes arrived well packed & damage free. Very happy with overall purchase. Will keep buying. Product quality very good packaging slightly damaged in arrival. A great product, my hair feels lovely and soft. Great price too. This stuff is great! My hair is bleached and it tames frizz and makes it so smooth! Yes fly aways too. I've noticed such a difference since I've started using it. My hair looks and feels much nicer. You only need 3-4 pumps (I have quite long hair). It's not greasy at all. Would Definitley recommend. Was dispatched straight away arrived on time and the product was as stated. perfect for my hair. it came highly recommended. Nice product to defrizz and de tangle, smells amazing and always get compliments on the smell of my hair when using this. Wouldn't say it really smoothed out my hair but I enjoy the scent so will repurchase. Hairdresser recommended this and just as explained to me. Great tretment, for dry hair. I have used this product before and I am very happy with it. Brill stuff smells delish hope it does what it says ! This is a super all round product for your hair. It protects from heat and sun, helps with styling and leaves your hair feeling amazing. Highly recommend uniq one! Great product, great results means great hair, I always find what I want and at a great price, marvellous website for all . Came quickly and half the price it would be in hairdressers. Was introduced this spray by my hairdresser 6 years ago. I have not used anything else since. Cant even think of anything that will match it. Great service from Just My Look and a great product too! I can not live without this spray! I've tried loads of others nothing has ever beaten this! Very good, a must have in my house. Excellent product. A must have. Love Revlon Unique One. I put in on hair after washing to help detangle when combing through. It is also great as a heat spray. It helps protect colour on my hair keeping my hair in good condition. Excellent hair product, even better now can take away on holiday in miniature size thanks. Great price....nice hair product which leaves hair smooth and smelling fab! Quick delivery and easy to navigate round the website. Thanks! My hairdresser recommended this for me because i straighten my hair all the time and one day a chunk of my hair snapped off! After using uniqone it is a wonder treatment! Hair grew back straight away and it makes my hair feel a lot stronger. Would recomend this to anyone who uses heat products on their hair as trust me, it takes it's toll!! My hairdresser recommended - defrizzes nicely. I am very happy with this product and it works very well for my hair that's. In future for sure I will order more. Lovely treatment. I use every time i dry my hair. Would recommend. Using this site Just for you, has been a god send , it's so easy to use and the choice is fantastic. I am able to get my hair treatment for half price, and will certainly buy from here again, I have told my friends and family about the site and they are very happy with it to.. They sell high quality products, prices are the best and it certainly comes top for hair and beauty weather at home or salon. I would tell anyone to give this site a try, you won't be disappointed, they certainly saved my money.